Welcome to the University of Calgary Competitive Programming Club website. If you enjoy programming, solving problems, and want to practice coding faster, more efficiently, and with fewer bugs, this is the place to be! We meet every Wednesday night from 6:00-7:30pm in MS 160 for coaching and practice. Saturday practice contests are also held regularly. To join the club, just join our mailing list. Thank you everyone who attended, volunteers, and Synopsys for another successful Calgary Collegiate Programming Contest. Copious amounts of caffine and subway/pizza were consumed by the hardworking teams. We would like to commend all of your efforts! Full results can be found at Kattis Contest Page. Events like these could not happen without the help of volunteers, participants, and our sponsor Synopsys. Thank you everyone! Welcome back to the winter semester! 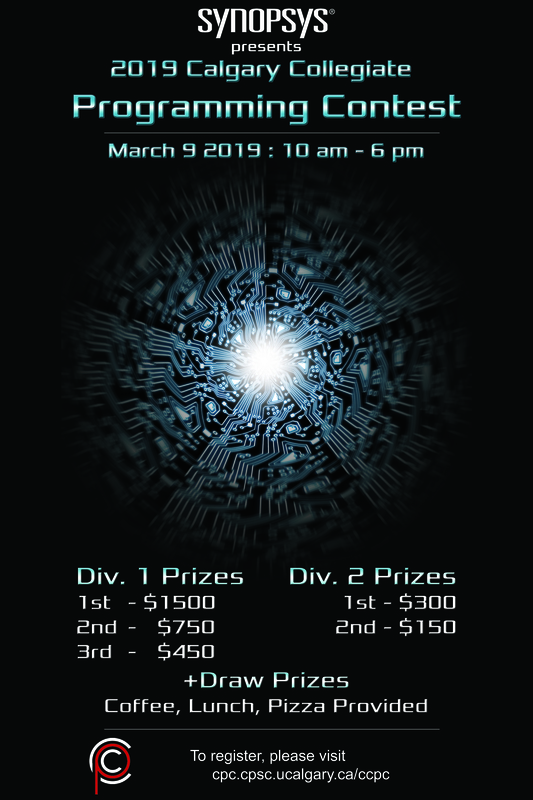 We are excited to announce that the Calgary Collegiate Programming Contest (CCPC) will take place on March 9, 2019. CCPC is hosted by us (CPC) along with the help of our official sponsor, Synopsys. There will also be lunch and coffee served at the event, along with a talk by Synopsys. This is the perfect event for students to demonstrate and test their problem-solving abilities through programming. We have two divisions, so we strongly encourage first-year students to test their skills in the contest. The deadline to register for the contest is March 7, 2019 at 4:00pm MST, but capacity is limited and has historically sold out! With that being said, you can register and find full contest details by clicking on the poster below or buttons above! ** Please note not all languages may be able to produce a solution to some questions. Div 1 - 1st place: "Off-by-One Error"
Div 1 - 2nd place: "Alberta Gold"
Div 1 - 3rd place: "Coesun"
Div 2 - 1st place: "Bullfrogs"
Div 2 - 2nd place: "Leo Gao"
Again, I would like to thank everyone who participated and made this event possible! We hope to see you at the Calgary Collegiate Programming Contest next year!